SEOUL (Reuters) - Tens of thousands of South Korean taxi-drivers held a rally on Thursday in Seoul, the capital, saying a carpooling service planned by the operator of the country's top chat app would threaten their livelihoods and jobs. It was the latest challenge to ride-sharing services in South Korea, which has one of the world's highest smartphone penetration rates, with nearly half its population of about 51 million living in the Seoul metropolitan area. Backlash from taxi-drivers and government regulations in Asia's fourth-biggest economy have hampered new transport services launched by U.S.-based Uber Technologies [UBER.UL] and domestic startups. Protesters wearing red headbands chanted slogans, waved flags and held up placards with slogans such as, "Let's crush the carpooling industry which ignores the taxi industry," and "Illegal business carpool app out." "The taxi industry will be long gone at the end," he added. Transport law bans the use of personal vehicles for commercial purposes, but allows carpooling during "commuting hours". "We will continue discussions with the taxi industry, related organizations and users before the service launch," it said in a statement. 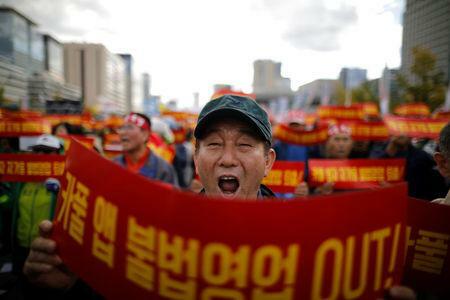 The taxi drivers' protest worsens the dilemma of South Korea's labor-friendly government, grappling with unemployment that hit an eight-year high in August. South Korea had about 270,000 taxi drivers on June 30. "The government is in a bind," said Ko Tae-bong, research head at Hi Investment & Securities. "If they keep dragging their feet over regulatory changes, South Korea will be left behind the global ride-sharing market."